From Raiders of the Lost Ark to the latest installment Indiana Jones and the Kingdom of the Crystal Skull, the adventure series has spawned some original designs that you see here. Show your love for the archaeologist-adventurer with original gift ideas seen here! Some artifacts are so priceless the only place for them is in a museum where they can be admired by everyone. Someone once told Indy that he belonged in a museum. Maybe your t-shirt deserves the same. Special shirts here for Dr. Jones fans. 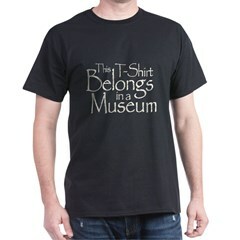 Obtainer of Rare Antiquities t-shirts and gifts for archaeologists and anyone studying archaeology. What do you call someone that digs around for old stuff in the dirt? An archaeologist, sure. But Obtainer of Rare Antiquities sounds so much cooler. This fan-created design features Indiana Jones' classic fedora with the simple caption "Archaeologist" - great for fans of the classic film franchise and/or inspired field scientists.